An update on the status of current, planned, and proposed capital projects, including new elementary, middle, and high schools. Discussion and possible approval of updates to the policy pertaining to a drug-free workplace. Meetings are held at the WCSD Admin Building, 425 E. 9th Street, in the Board Room. CTE Advisory Technical Skills Committee/Council on CTE: Sept 10 at 5:30 p.m.
Zoning Advisory Meeting: Sept 20 at 5:30 p.m.
All meetings held at the WCSD Admin Building, 425 E. 9th Street, unless otherwise noted. The Board voted to increase employee health insurance rates by 10% in order to cover increasing costs, accepting the recommendation made by the Group Insurance Committee. The Board approved the contract renewal for Renown Health. In a separate item, the board also voted to direct the Superintendent to start the process of putting together a Request for Proposal for the District's health plan. The Board voted to direct staff to focus efforts of the 2019 Legislative Session on matters related to increasing financial resources. The next WCSD Board of Trustees meeting will be September 11 at 2 p.m. at the Admin Building, 425 E. 9th Street. Student Attendance Advisory Committee Meeting, September 7 at 9:00 a.m.
CTE Advisory Technical Skills Committee and Council on CTE, September 10 at 5:30 p.m. Meetings are held at the WCSD Admin Building, 425 E. 9th Street, unless otherwise noted. Want to get involved? Apply to join a board committee. A discussion about beginning the process to request proposals from outside agencies for the District's Health Insurance Plan. Possible actions regarding the District's health insurance rates and hospital contract with Renown. A discussion about the District's strategy for the upcoming legislative session. Updates on special education, including information about the work that's been done to improve the education and experience of students with disabilities and information about alternative education and options. Audit Committee meets on Aug. 27 at 4:00 p.m.
Other Post-Employment Benefits Trust Committee meets on Aug. 30 at 1:00 p.m.
Group Insurance Committee meets on Aug. 30 at 2:00 p.m.
Student Attendance Advisory Committee meets on Sep. 7 at 9:00 a.m.
Board Policy Committee meets on Sep. 4 at 2:00 p.m.
CTE Advisory Technical Skills Committee meets on Sep. 10 at 5:30 p.m.
Council on Career and Technical Education meets on Sep. 10 at 6:15 p.m.
Committee members and chairs come from all walks of life – they’re parents, retired teachers, community advocates, and students. But they are all volunteers who dedicate time to committee work in order to make the Washoe County School District the best it can be. During the 2018-19 school year, we will feature a different committee chair each month. Robin Tanner may have retired from teaching high school media, but as chair of two District committees that advise on Career and Technical Education (CTE) she still gets to influence student success. Both the Council for Career and Technical Education(CCATE) and the Advisory Technical Skills Committee (ATSC) help to guide the development of CTE programs to ensure a connection between education and workforce opportunities in our region. The Advisory Technical Skills Committee is comprised of various industry and workforce development representatives, school district staff, a student, a parent, and post-secondary education partners. The Council for Career and Technical Education is a subset of the ATSC members tasked with guiding procedures, curriculum alignment and resources for CTE programs. 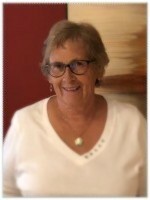 Robin has been on the committee for 5 years and has served as chair for the last year. She says she keeps volunteering because she knows that she is playing a meaningful role in advancing students’ educational opportunities. One of the projects she is proudest of is a matrix the committee developed a few years ago that helps CTE teachers and students measure development of employability skills based on employers’ expectations. This helps ensure that CTE programs are preparing students for lifelong careers success. She also is proud of the community partnerships that the committees have helped foster for students. Because of these relationships, students have been able to involve themselves in unique educational opportunities like job shadowing, internships, scholarships and career advancement. The Advisory Technical Skills Committee and the Council for Career & Technical Education will meet next on September 10, 2018, in the boardroom. This year, the committee will be focused on strategic expansion of CTE programs and increasing enrollment to meet the District goal of 50% of all high school students enrolled in one or more CTE classes by 2020. The Board discussed a possible increase to the District's health insurance rates. Health insurance expenses are projected to increase by 12.9% next year and the Insurance Committee had recommended a 10% rate increase for employees, which partially covers the hike. The Board discussed this option at length, but ultimately took action to send it back to the Committee for further recommendations as to how to cover the remaining 2.9% increase (which comes to about $2 million). The Insurance Committee will discuss the issue at their August 21 meeting. The Board also tabled a discussion about the health insurance contract until their next meeting. The Board heard an update about potential legislative priorities, including possible ideas for a District-sponsored bill introduction. The legislative session begins in February 2019. The Board approved the allocation of $16.4 million of capital funds to be used for school building repairs, and expansions to nutrition services and the transportation yard. The Board heard from students across the District who reported back about the success of their first week. The next Board of Trustees meeting is August 28 at 2 p.m. in the District Board Room, 425 E. 9th Street. Know someone who might be interested in Board News? Here's the sign up link. A discussion about the legislative priorities for the upcoming 2019 Legislative Session. An update on the status of teacher recruitment, hiring, and vacancies for the current academic year. A presentation about digital learning, including the use of cell phones and personal technology devices in classrooms. Possible updates to the District's health insurance contracts and rates. Interested in learning more about committees and how you can get involved? Visit ourCommittee application page. The Board heard updates on the District's performance related to strategic plan goals. This is the second update the board has received from various departments reporting on goals. Specifically, the metrics shared were centered on academic growth, effective personnel, family engagement, and school safety. The Board approved the final language for the results and definitions to be used during the priority based budgeting process, which is a national best practice for budgeting that prioritizes resources based on the results that matter most. The Board held its public hearing on the issuance of up to $300 million in general obligation bonds, the WC 1 initiative as approved by voters in 2016. This $300 million is anticipated to be used to finance the acquisition, construction, repair, and renovation of school facilities, pursuant to the District’s Capital Improvement Plan. These projects will primarily consist of a new middle school in the Arrowcreek area, a new elementary school in the Spanish Springs area, a new high school in the Wildcreek area, and repairs to existing schools, as those projects are approved by the Board of Trustees at subsequent meetings. The next board meeting will be August 14 at 2 p.m. in the Administrative Building Board Room, 425 E. 9th Street in Reno. 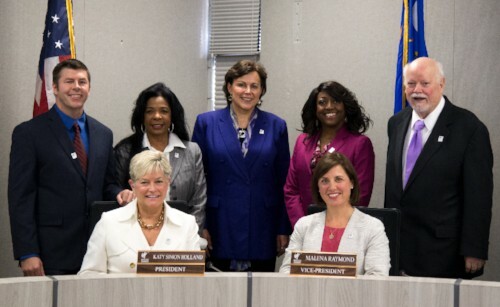 Clockwise from top left: Trustee Scott Kelley, Trustee Debra Feemster, Trustee Verónica Frenkel, Trustee Angela D. Taylor, Clerk John Mayer, Vice President Malena Raymond (seated), and President Katy Simon Holland (seated). Back to School Expo, August 4 from 12 noon to 4 p.m. at the Meadowood Mall. A presentation giving an overview of special education funding in the District, including history of the Individuals with Disabilities Act and local grant funding. A public hearing and possible approval to issue up to $300 million in general obligation bonds, which will be repaid from sales tax revenue (as approved by voters in 2016).This $300 million is anticipated to be used to finance the acquisition, construction, repair, and renovation of school facilities, pursuant to the District’s Capital Improvement Plan. These projects will primarily consist of a new middle school in the Arrowcreek area, a new elementary school in the Spanish Springs area, a new high school in the Wildcreek area, and repairs to existing schools, as those projects are approved by the Board of Trustees at subsequent meetings. An update on the strategic plan and presentations on metrics pertaining to academic growth, volunteer services, and school safety, among other topics. The Board approved the new calendar for the 2019-2020 school year. Under the new calendar adopted by the Board, school will begin one week later—in the second week of August—and will end the first week of June. Winter break will also be shortened to two weeks. The Board discussed the priority based budgeting process. The Board voted to renew charters for the following District Charter Schools: Sierra Nevada Academy, Encompass Academy, Mariposa Academy, High Desert Montessori School, Bailey Charter School, Coral Academy of Science. The board approved I Can Do Anything Charter High School as minimally compliant due to some areas of concern. I Can Do Anything's charter will be up for renewal in June 2019. Please note, there will only be one Board Meeting during July, to be held on July 24. A review of the balanced calendar survey results and a discussion about the 2019-2020 school year calendar. An update on the status of the priority based budgeting process. Presentations and possible action to renew charters for the following District Charter Schools: Sierra Nevada Academy, Encompass Academy, Mariposa Academy, High Desert Montessori School, Bailey Charter School, Coral Academy of Science, and I Can Do Anything Charter High School. In a unanimous decision, the Board passed a resolution against arming educators. The Board provided preliminary approval to several policies related to athletics, including extra-curricular student activities, district recognized sports, district sanctioned sports, and community use of school facilities. The Board will be accepting public comment on the policies until Monday, June 25. The Board voted to renew the contract of Superintendent Traci Davis for two years, with an automatic third year if goals are met.